Yet another win from a break! Yet another maiden grand tour victory by a young rider. Valerio Conti attacked from the day’s break and quickly disappeared from view along the winding roads to solo across the line almost a minute ahead of his break mates, runner-up Danilo Wyss and third-placed Sergey Lagutin. The peloton finally rolled in a record-breaking 33:56 down but there were no changes on GC: Nairo Quintana (Movistar) remains in the lead. There were 12 contenders for today’s VeloVoices honours, however, the spoils go to today’s stage winner, Lampre-Merida’s 23-year-old Valerio Conti, who escaped from the remnants of the day’s 12-man break to solo across the line in Urdax-Dantxarinea almost a minute ahead and claim his biggest win and first grand tour victory. Conti timed his offensive to perfection after multiple attacks with under 20km remaining finally splintered the group. Seizing the initiative, he quickly built a workable advantage on the narrow, winding roads on the finishing circuit ahead of a quintet of chasers who found themselves riding for the remaining podium places. Conti gave notice of his potential with a 27th place finish in this year’s Giro d’Italia. 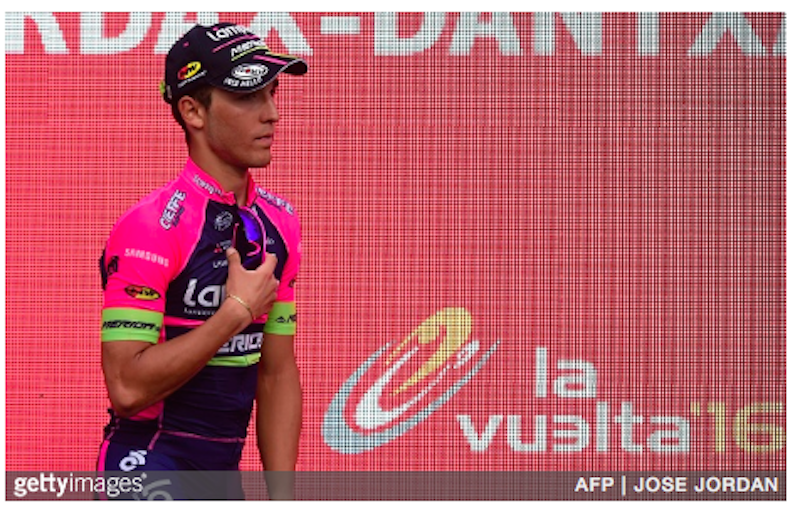 This was his third Vuelta a Espana – surely, next year, the Tour beckons for this talented youngster. I knew the break would go all the way because we’d taken an enormous gap. I’d picked out today as one to have a go in the break and it was a good break. It’s my first win in a Grand Tour. I didn’t have the best of legs at the start but I kept getting stronger as the day went on and took my chance in the final. Chapeau, or should that be txapela (big, black floppy beret), given Conti has won in the Basque country? At today’s sign-in, fifth placed Alberto Contador (Tinkoff) expressed the hope of a relatively gentle day ahead of tomorrow’s taxing ascent of the Aubisque while second-placed Chris Froome (SKY) confirmed he was looking to save energy before tomorrow’s queen stage. So I’m sure all the GC contenders were happy with today’s pace and outcome. From the off, the pace was fast and furious with the 12-man break forming at around 25km, rapidly receiving the Movistar-led peloton seal of approval. The break worked well together to build an impressive advantage of over 22 minutes. The winner Conti finished a record setting 33:56 ahead of the peloton/grupetto. @VeloVoices @LVCKV Tour 2006, Béziers-Montelimar. Winner's time 5:24:36, peloton finished 29:57 minutes down. Today’s medium mountain stage traversed some of my favourite places in the Basque country, particularly the spectacular coastline from Deba to San Sebastian. While there were only four cat. 3 climbs, there were plenty of obstacles that had escaped classification. Let me assure you that it’ll have been a lumpy old – and at 213.4km very tiring – stage. Sadly, it’s unlikely the peloton will have had time to appreciate the scenery, some riders, who’ve already ridden in the Vuelta al Pais Vasco, knew what to expect. Racing the climbs in the Basque Country is like one big hotbox. You'd think a marijuana field was on fire!